Many of you will be familiar with the Ubuntu Accomplishments project I have been working on recently. Well, we are gearing up to release our very first 0.1 release in the next week in a PPA, but we have one area where I would like to reach out to you folks for help. We want to ensure that Ubuntu Accomplishments is available in as many languages possible; not just the application, but also the fantastic documentation that is part of the application. As such, can I please ask you wonderful people to help contribute your translations by following the instructions below. Go to the daemon translations page and the viewer translations page. Ensure you have the language you want to selected (you can change this by clicking the Change your preferred languages… link at the bottom of the page. You should see a row for each language you have selected. Click on the number under Untranslated and go and add your translation. Sit back and bask in your wonderful contribution to Ubuntu Accomplishments! Oh, and if there are no translations for your chosen language, please do go and add translations! For each of the different opportunities (things you can achieve in the system) we provide comprehensive documentation for how to achieve that particular accomplishment. Go to the Ubuntu Community Accomplishments translations page. The translation of Ubuntu Accomplishments works a little differently. You should IGNORE the English line at the top and instead look at the documentation just below. There it tells you which accomplishment you are editing and what the original English translation is. You can now type your own language’s documentation into the New translation box. For the larger chunks of text you can use the grey button at the end of the New translation box to make the text entry bigger. If there is already a translation there and you want to edit and improve it, click the Current <language> translation button and the text will be copied to the edit box where you can edit it. 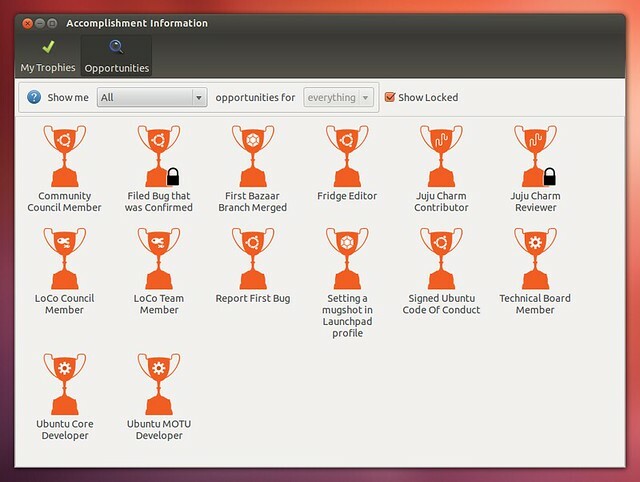 Thanks in advance to every one of you who helps to translate Ubuntu Accomplishments! Application software, also known as an application or an “app”, is computer software designed to help the user to perform specific tasks. Examples include enterprise software, accounting software, office suites, graphics software and media players. Many application programs deal principally with documents. Apps may be bundled with the computer and its system software, or may be published separately. Some users are satisfied with the bundled apps and need never install one. wow, thank you for this post very useful, in the near future I plan to create a translation software.